For those unaware. 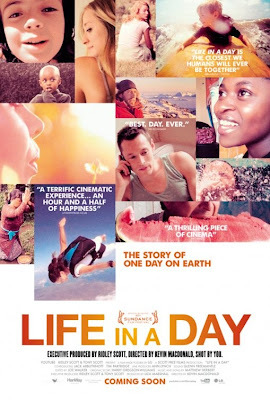 "Life in a Day" is an experimental documentary film that asked the world to document itself for an entire day (Specifically the 24th of July, 2010) in order to create an accurate depiction of what it was like to live on this planet during this time. Using YouTube for submissions, the production team for this film received around 80,000 entries totaling over 4,500 hours of footage from over 140 nations. The film is made up entirely of the footage shot by the people of this planet over the course of that single day and runs about 90 minutes. Now, first of all, I want to say that I don't really consider this a review. Because there is simply no effective means of analysing a film this unique. I also want to say that you won't find much detail about the films content in this blog, it needs to be discovered, not read about. Want to know more? I encourage you to go see it for yourself. The first thing I will say about this film, is that despite the fact that alot of the footage consists of people simply going about their day to day lives, it manages to never, not once, become boring. I was genuinely enthralled for the entire thing. This is partly because the film has a tremendous scope in terms of the cultures it depicts, so many of the activities that are ordinary or mundane for the person on screen, are interesting to those unfamiliar. It must have been almost impossible to score a film with such varying tones and themes, but they pulled it off, the music in this film is nothing short of astounding. Alot of the clips have sentiment attached to them, whether that be something joyful or something sad, and the films music never fails to emphasis that emotion making the clips all the more powerful. The editing is wonderful, not just in terms of how these clips look mixed in together, which incidentally is pretty great too, but it's also amazing in terms of the order in which they are presented to us. The film isn't afraid to contrast carefree or uplifting moments with darker or saddening material, and that works entirely in it's benefit. Every clip you will see in this film has something to say, more often than not it's a simple message, but sometimes it touches on something deeper. It's not always intentional, the people in these clips sometimes stumble across something profound without realising it. And really, now I'm touching upon the real reason I think film is brilliant. For me, the most amazing thing about this film, is how relentlessly honest it is. They could have chose clips that placed rose tinted glasses over the world, clips that show all the strength and wonder in the world and none of it's many imperfections. But they didn't do that, far from it. I'm sure they received hundreds of clips of people trying to force interest into their lives, acting unlike themselves to ensure they looked good for the camera, but I saw none of this in the film I saw today. The filmmakers really knew how to chose people and clips that felt truly genuine and sincere. If I were to be picky and find a flaw in the film, it would be that the movies end didn't give me a sense of the day ending. The start of the movie had glimpses of people starting their day, but we never really saw a lot of footage showing the day winding down, it would have been nice to frame this film within the day at the end too, but this is a really minor issue. It's funny, sad, touching, tragic, uplifting and completely honest all at once. It is a film about the world, not how it wants to be presented, but exactly as it is. And that alone is remarkable. PPS: Yes, that was an absolutely shameless plug.